When you’re looking to save money on baby supplies, it makes sense to purchase products that can be used for a longer period of time. Because most rear-facing only car seats have to be replaced once the baby reached 20 pounds (9.07 kg), they only last for a few months. This meant your first carseat would only last for a while, and you’d need a new one once the baby exceeded this weight limit. 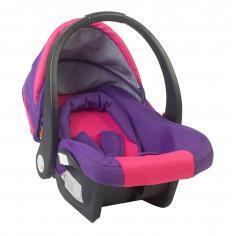 A newer trend is the convertible car seat, which addresses this issue of car seat replacement. Unlike the infant car seat, the convertible car seat will often carry kids up to a weight limit of 40 pounds (18.14 kg), or in some cases an even greater weight. It can be suited for brand new babies too, since it can be adjusted to face the back of the seat or to face forward in the car. It’s recommended that you keep babies in a backward facing position until they are one year old, which can be a plus because some babies will exceed 20 pounds in weight long before they reach the end of their first year. It’s important to read instructions for your specific convertible car seat, but many will allow you to keep babies facing toward the back of the car until they are about 30 pounds (13.61 kg). You also have to carefully read instructions on installation, since where you thread the seatbelt will be different depending on whether the convertible car seat faces forward or back. It’s also important to make sure the seat faces back for the first year of a baby’s life. This should be taken very seriously because there is a high rate of incorrect installation of car seats even by careful, competent parents. All the seat's safety features are useless if it is incorrectly installed or in the wrong position for your baby’s age. When in doubt, your local police department or fire department may be able to check it for you to make sure you’ve got it correctly in place. There are many companies that make at least one convertible car seat. Though these might be slightly more expensive than infant car seats, in the end you pay less by not having to replace the infant car seat. Perhaps the most important feature to look for, in addition to the car seat being new and safety rated, is the ability to wash the car seat cover and straps. Look for seats that will allow you to remove all or most fabric to wash. Babies are known for their messiness, and you don’t want to have to replace a car seat because you can’t adequately wash fabrics that may be soiled by common baby messes. Due to the fact that you may use the convertible car seat for several years, you should inspect it regularly for wear and tear. If you get in an accident, even a small one, it’s recommended you immediately replace the seat. Furthermore, keep the model number, brand and style information someplace safe and periodically check sites online that post information about recalls. Replace the seat if you find any information that suggests the seat has been recalled for defects. What are Some Different Types of Car Seat Covers? What Should I Know About my Children Traveling Alone?